On February 9, 1960 the last of the new American Football League franchises to name a head coach for the inaugural season did so. 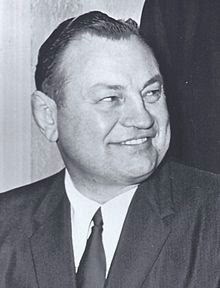 Eddie Erdelatz, a native Californian who had been successful at Navy for nine years, was introduced as the new head coach of the as yet unnamed Oakland football team. The 46-year-old Erdelatz (he turned 47 prior to the ’60 season) played college football at St. Mary’s and became an assistant coach there and at the Univ. of San Francisco afterward. Following service in World War II in which he was a naval officer, he was an assistant coach at Navy before first entering the professional ranks as defensive coach for the San Francisco 49ers of the AAFC. 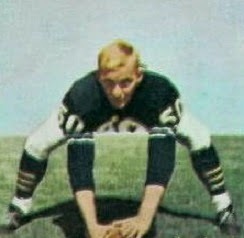 He returned to the Naval Academy, this time as head coach, in 1950. The Midshipmen had posted losing records prior to his arrival, winning a total of just five games in the preceding four years. By 1952, the third year under Erdelatz’s direction, they had a 6-2-1 record, and they didn’t post a losing tally for the remainder of his tenure. Overall, Navy went 50-26-8 under Erdelatz, including wins in the Sugar and Cotton Bowls. Erdelatz abruptly resigned in April of 1959 due to a dispute that had developed with the athletic department. He sat out the ‘59 season and had recently been passed over for the head coaching position at the Univ. of California, where he was considered a leading candidate, losing out to Marv Levy. “We’re just getting started and I don’t know any more about this than the next guy,” said Erdelatz, whose signing was viewed as a step toward gaining credibility for the fledgling club. The Oakland franchise had not yet been named, did not have a home field, and had not signed any players. They were a latecomer to the new circuit, having replaced the team that was originally slated to play in Minnesota but was lured away by the NFL (to begin play in 1961). As a result, the franchise’s draft choices had gone unpursued. To help the late-starting team fill out its roster, it was allowed to choose five unprotected players from each of the other seven AFL clubs. Oakland had an eight-member ownership group, the leader of which, Chet Soda, attempted to foist the name Senors on the new club before it was named the Raiders. Finding a place to play in the Oakland area proved more difficult, as the regents of the Univ. of California turned down a request to use that school’s stadium and the Raiders were forced to share San Francisco’s Kezar Stadium with the 49ers. Oakland lost its first two games, including the opener at Kezar Stadium against the Houston Oilers with only 12,703 fans in attendance (which proved to be the season high). However, the Raiders then beat the Oilers in the rematch at Houston and that was the first of three wins in four contests to get them to .500. They were 5-5 before losing three straight games, including back-to-back defeats by lopsided scores to the Chargers, and finished at 6-8 which, all things considered, was viewed as a respectable result and put them in third place, ahead of Denver, in the Western Division. Veteran Babe Parilli and newcomer Tom Flores from the Univ. of the Pacific alternated at quarterback, and Flores led the AFL in completion percentage at 54.0. The offense was ground-oriented and topped the circuit in rushing yards with 2056. HB Tony Teresa led the way with 608 yards on 139 carries (4.4 avg.) and six touchdowns. FB Billy Lott contributed 520 yards on 99 attempts for a healthy 5.3-yard average gain and also led the club in pass receiving with 49 catches for 524 yards. End Gene Prebola and flanker Al Goldstein were the best of the receivers. Several rookies that the Raiders were able to sign made good on the offensive line, including center Jim Otto out of the Univ. of Miami (pictured below), who moved directly into the starting lineup and ended up being an All-AFL selection. G Don Manoukian was another first-year player who started, garnering second-team All-AFL honors, and while the other guard, Wayne Hawkins, didn’t receive any honors in ’60, he did as a mainstay on the line over the remainder of the decade. The defense was far less impressive. While there were capable performers at defensive end in Charley Powell and Carmen Cavalli, the tackles were undersized and had difficulty stopping the run. MLB Tom Louderback was steady and CB Eddie Macon, who intercepted nine passes, and safety Alex Bravo were ex-NFL and CFL players who did well in the backfield. But only the Broncos gave up more yards than Oakland’s 4983 and the Raiders surrendered 28 touchdown passes, tying with Houston in that category for the most in the league. Beyond what happened on the field, the Raiders averaged a league-low of 9875 in attendance at each home game. It was hoped that a move to Candlestick Park for 1961 would help (it would be another year before a temporary home was finally constructed in Oakland). The situation was not helped by disarray in the front office and ongoing financial problems. Only six of the 30 draft choices were signed for ’61. Commissioner Joe Foss stepped in to broker a consolidation of the ownership syndicate down to three people. The Raiders traded Babe Parilli to the Patriots, making Tom Flores the unchallenged starting quarterback. However, any optimism regarding the ability of the Raiders to build upon their 1960 foundation was quickly quashed when Oakland lost its first two games by a combined score of 99-0 (55-0 to Houston and 44-0 to the Chargers). Erdelatz suffered the distinction of being the first AFL head coach to be fired and assistant Marty Feldman took over. It didn’t help, as the club finished at 2-12. Erdelatz ended up with a 6-10 record as coach of the Raiders in what was his last coaching job. After failing to land head coaching positions with Army and the St. Louis Cardinals of the NFL for 1962, he left football for a business career that ended with his death from cancer just four years later. The Raiders would sink to 1-13 in 1962 before the hiring of Al Davis as head coach and general manager in ’63 brought about a turnaround in the troubled franchise’s fortunes.